Posted byshaneschnell	 March 6, 2005 Leave a comment on J St.
After watching some high school basketball at Arco Arena, my flatmate and I went on a tour of J St. I called a buddy of mine and he recommended that we check out a Spanish food place called Tapa the World. I highly recommend it now too!! We had sangria, Filet Mignon Beef Tips, Grilled Chicken Strips, Champiñones al Ajillo, and Gambas al Ajillo. I really enjoyed the ambiance, it made you feel like you were sitting on a little street outside of Barcelona. From there we walked up and down J St. until we stumbled apon what is a highly rated Blues club called The Torch Club. I enjoyed the music, but the service left a lot to be desired and I think that the bartender might have spiked the beer with acid. I was glad to finally explore Sac-Town, I have lived in Nor-Cal for almost 6 years and had never really spent much time there. 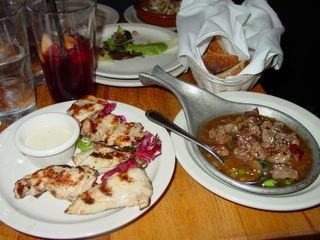 Here is a picture of the Sangria, Grilled Chicken Strips, and Filet Mignon Beef Tips at Tapas.